In May 2011, I posted a blog entry featuring the above photograph, which is from the Library of Congress. The photo shows a soldier in uniform, a wife in dress and hat, and two daughters wearing matching coats and hats. More details can be found at the Library of Congress record for the photo, which is here. The Library of Congress description for the photo lists the soldier and family as “Unidentified.” But thanks to research whose results were published in the November 2012 issue of Kentucky Explorer Magazine, it is believed that the photo depicts Sergeant Samuel Smith of the 119th US Colored Infantry, his wife Molle and their daughters Mary and Maggie. Sergeant Smith enlisted at Camp Nelson, Kentucky. 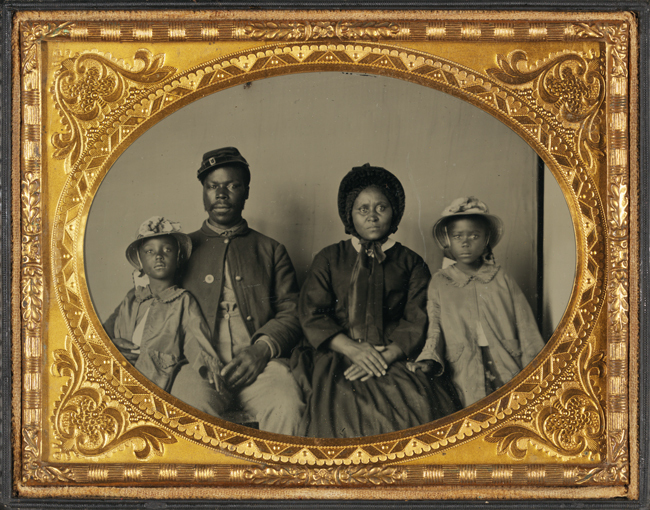 More details about the Smiths are provided by Angela Y. Walton-Raji at her blog The USCT Chronicle. Thanks to Kentucky Explorer Magazine and Angela Y. Walton-Raji/The USCT Chronicle for providing this information! PS, I met Angela Y. Walton-Raji several weeks ago during a visit to the African American Civil War Museum in Washington, DC. It was a brief meeting, but it was fun to talk to a fellow blogger. I wish her well on her labor of love. This entry was posted in Photographs, US Colored Troops and tagged Camp Nelson, USCT. Bookmark the permalink. Reblogged this on mag the historian.